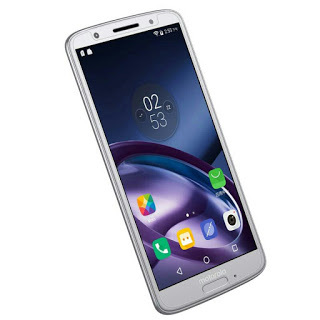 Motorola unvieled their latest smartphones in Moto G6 series and Moto E5 series as Moto G5,G5 Plus,G5 Play,E5,E5 Plus and E5 play.The smartphones are running on Android 8 Oreo and Moto G6 series phone features water resistant coating for protection. The Moto G6 features 5.7 inch IPS Max Vision with 2160×1080 pixel resolution at 18:9 aspect ratio, and is covered with Gorilla Glass3.It is equipped with 1.8 GHz Snapdragon 450 octa core processor with Adreno 506 GPU and hardware is mated with 3G/4GB RAM and 32FB/64GB internal storage.The device runs on Android 8 Oreo.The dual sim supporting phone also supports sd card upto 128GB.In the camera department,it has 12+5MP dual camera with LED flash,f/1.8 aperture on rear and 8MP single shooter on front.The phone is juiced with 3000 mah battery.It comes with 4G LTE,Wifi 802,11 a/b/g/n,wifi hotspot,bluetooth,GPS,USB Type Cand 3.5 m audio jack. # 5.9 inch IPS Max Vision display,2160×1080 pixel resolutio,18:9aspect ratio,Gorila Glass 3 for protection. # 5.7 inch IPS Max Vision display,1440×720 pixel resolution,18:9 aspect ratio. #4G LTE,GPS,Wifi 802.11 a/b/g/n,Wifi hotspot,bluetooth. #Dimensions 161.9×75.3×9.35 mm and weighs 200 gms. # 4G LTE,GPS,FM radio,Wifi 802.1 a/b/g/n,Wifi hotspot,Bluetooth.